With a better skill of writing English, we can easily bring to audiences our ideas more effective and faster on the road of blogging. Unfortunately, a number of bloggers do not have this favor, this imperfection puts them at many disadvantages; such as their articles/posts look not professional, their SERP (Search Engine Results Page) has a lower level because the search engines prefer to pay attention to the well-written content over an article with full of spelling checking errors, etc. Recently, there have been a lot of changes concerning the writing scenario in comparison to the circumstances which was very much common a few years ago. Previously, the typo errors and also the spelling mistakes were generally accepted in the publishing industry and people seemed not to worry so much about these sides. But nowadays we are aiming for more perfection and so comes the requirement of advanced online English grammar checker tools. The online spelling checker is a quick requisite of the modern times and you will be amazed to see how this type of application has been proved to be helpful to the people associated with writing industry. Today, I like to present top ten popular online tools for helping you write online English grammar better. They have many features to help you improve the writing skills; obviously, they’re free and very easy to use, no requirement but a browser. Hope you like this post and my others. If you want to check the grammar or spelling of any of your written article, then SpellChecker is just perfect for you. There is a large input where you will have to copy and paste the content and click on the Spell Check button. A new window will open immediately after you submit the content to be checked. You can replace the wrongly spelt words with the correct one, or with their synonyms as this English checker tool provides online thesaurus. 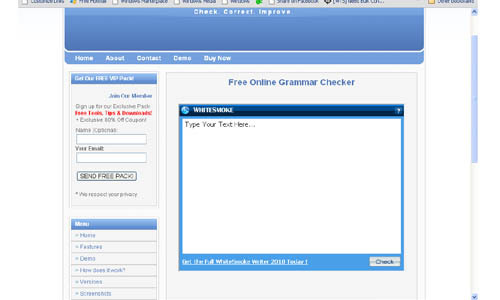 Moreover, it assists in correcting grammatical mistakes as well, and you can use this online grammatical checker tool for checking the spell of 24 countries at present. 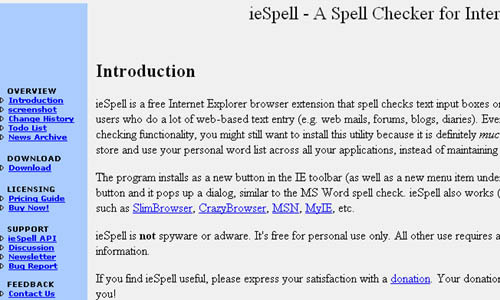 ieSpell is an extension for Internet Explorer browser that checks spelling of texts totally free. It is a very handy application and therefore users who have to do loads of web-based text entry including blogs, forums, web mails find this really helpful. You can do your job much faster than before if you just install this utility on your computer. En.spellcheck.cc offers a free application to check any articles written in English. Using this tool you can correct your spelling as well as grammatical errors within a short time because it uses AJAX to fetch the results. It is very simple to use. Therefore a large number of people prefer to use this application for proof checking. It is one of the most popular online English checkers. 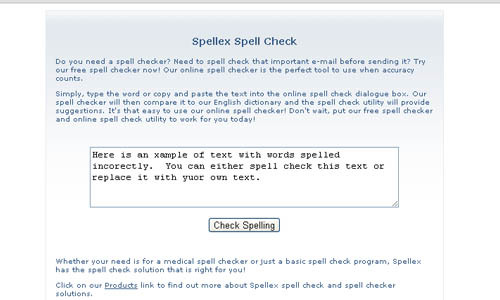 You can use this application to make spelling checks whether your written documents contain any unwanted spelling mistakes. After the landing page appears, you can see a large box where you just need to type or paste the contents you want to check. If there is any mistake the free application will notify you and you can replace it with proper one. SpellcheckPlus is a wonderful web-based solution for those who are looking for free English checker tools for proofreading. This application enables the user to check or correct grammatical or spelling errors within a few seconds. Another advantage of using this tool is it doesn’t change the required word formatting, since it is compatible with Microsoft Word files. Right beside this tool, we have a short video to help you use this tool faster and easier. 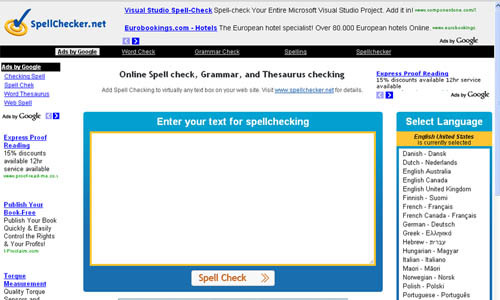 SpellCheck is another tool that offers online spell checking tools for free. You can paste your content on the box placed at the top of the page and check the spelling. It also displays the word count. A unique advantage of using this application is that you can set your text in Upper case, Lower case and Proper case format in a single click which saves lots more time. This free online grammatical checker of EnglishWriting.net named is WhiteSmoke, it’s an easy-to-use online spell checker. It takes minimum time to check your English spelling and grammar. This tool offers us a free service with some limitations and a premium version with full features for $10 at least. 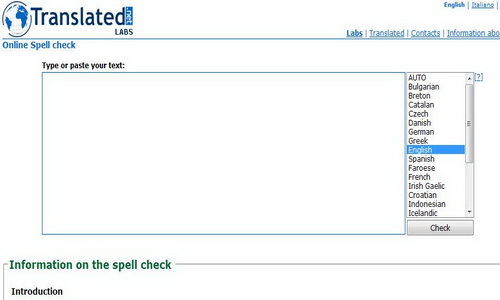 If you need to spell check any important email before sending it you can try Spellex. It is free English spelling checker software that makes any written content 100 percents error free. You can type the word or paste the text within spell check dialogue box on the webpage. 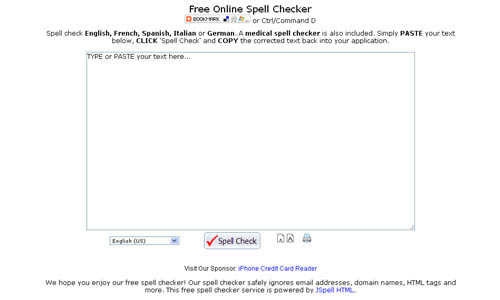 The outstanding spell checker tool will then compare it to the English dictionary and will provide suggestions. 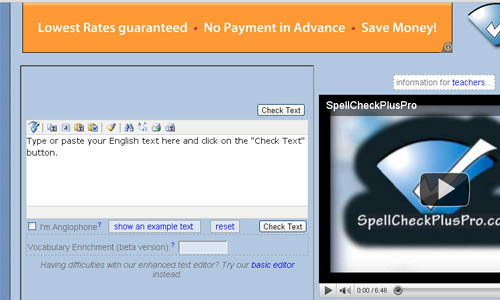 If you want a free online tool that will ease your proof checking job then SpellJax is another option for you. You may paste any content within the box that appears on the website landing page. After that, just click on the “Check Spelling” button on the right hand corner of the box. If there is any error the respective word will be highlighted in Green color so that you can change it accordingly. 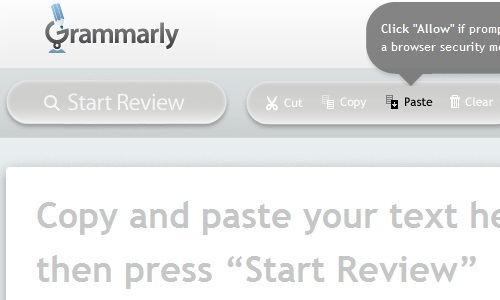 Grammarly is a spelling, grammar, and plagiarism tool used by over 300,000 students worldwide. To use Grammarly, you simply login and paste your text into the textbox. Click ‘Go’ and Grammarly checks the basics such as spelling and typos, but also performs very sophisticated checks for complex English rules such as dangling modifiers and comma splices. Grammarly’s algorithms are so sophisticated that hundreds of Colleges and Universities have selected the tool to be used by their students to help improve their writing. I guess http://www.grammarbase.com can be added here. It is free and pretty simple. However it catches lots of basic grammar mistakes. however , I want that online programs not to need a number card , eg : visa , bank…….. I need the best free tool I can use to spell check and grammar check a website for a client. I used TextTrust, but I’m trying not to have to pay for the error report or subscribe right now. The site is about 1866 pages after TextTrust crawled it. I make a lot of mistake that negatively effect my writing. Thats not good. I want alway to make the good choice of verbs. I want also to improve my pronunciation. My English-speaking friends talk about to help, but they never do. I work in a big store on the south shore of Montreal where there are a lot of immigrants people. I’m speaking every day to a men that works there. I think practicing with immigrants is equally as effective. So far, I have work there since 2 weeks and my English is getting more better. Also, I have learned already a lot about retail, but I will like to have a better job. I am waiting still for my first paycheck. They don’t have paid me yet. When I will get paid, I will pay my parking tickets. Nevertheless if my English would be more better, I would definitely get a better paying job. I often wonder how many opportunities I would had had if I paid more attention to my nice English teacher in high school. You can find a free British English Grammar Checker at http://www.grammarchecker.co.uk. British English grammar differs slightly from American English grammar. Almost all of the sites you list are trivial spelling checkers. The 4 major grammar checkers on the market that check spelling AND grammar extensively are Editor, Grammarly, StyleWriter, and WhiteSmoke. None of them can catch everything, and most grossly exaggerate what they can do. Just for example, Grammarly advertises plagiarism checking but doesn’t mention that it’s only online. Copy our of a printed book, and you’re home free–unless someone checks you on Google or TurnitIn, which have vastly greater coverage, including printed sources. If you have a dangling modifier, Grammarly, which advertises dangling modifiers as a specialty, will catch it only about half the time. Only StyleWriter and Editor do much to help writers avoid the stylistic problems–redundancy, wordiness, cliches, and tired expressions–that plague inexperienced writers’ prose. NONE of these checkers can help second-language speakers unless they are reasonably fluent already; for WhiteSmoke and Grammarly to claim they can “perfect” any writer’s work is criminal. GrammarCheck.me Is my favorite website to use. 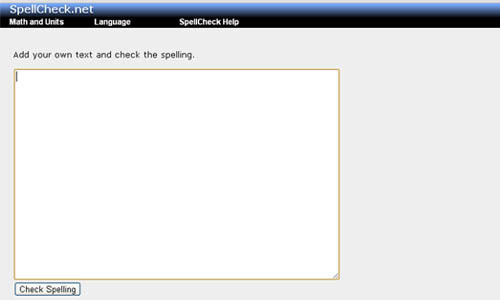 thanks for sharing with us these online english spelling checker tools, its really help me.